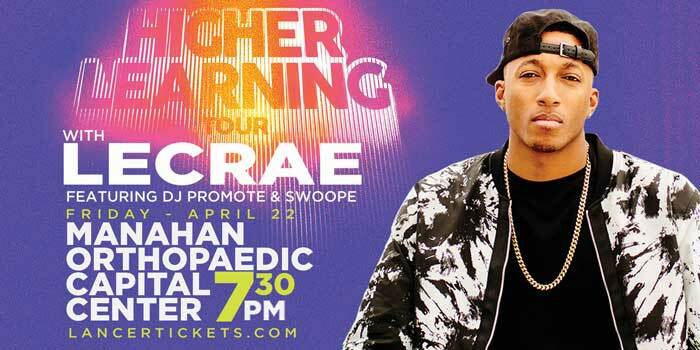 WINONA LAKE — Award-winning Christian hip-hop artist Lecrae will soon speak and perform at the Manahan Orthopaedic Capital Center on the campus of Grace College. The influential rapper, often known for his music message frequently at odds with his hip-hop peers, has sold 1.7 million albums to date, including more than 325,000 copies of “Anomaly,” his latest No. 1 debut. In last year’s Grammy Awards, Lacrae was nominated for the coveted Best Rap Performance. On Friday, April 22, Lecrae will speak during chapel at 10:30 a.m. and perform in concert at 7:30 p.m. at the Manahan Orthopaedic Capitol Center, 610 Wooster Dr., Winona Lake. Grace College chapel is free and open to the public. For more information on Grace College chapel, please visit www.grace.edu/campus-life/chapel. The concert, part of Lecrae’s Higher Learning Tour and the only tour stop in Indiana, will feature special guests DJ Promote and Swoope. Concert doors will open at 6 p.m. for VIP entrance and 6:30 p.m. for general admission. Tickets are now on sale and only available online at http://lancertickets.com/.